fourteen volumes of poetry, including Black Feeling Black Talk, Black Judgement, Cotton Candy On A Rainy Day, My House, The Selected Poems of Nikki Giovanni, and, most recently, Love Poems. A professor of English at Virginia Tech, Ms. Giovanni reads her work all over the country. She is the recipient of an NAACP Image Award, holds the Langston Hughes Medal for Outstanding Poetry and has been named woman of the year by Mademoiselle, Ladies' Home Journal, and Essence. She holds a B.A. from Fisk University, as well as numerous honorary degrees, including an Honorary Doctorate of Arts from Delaware State University, an Honorary Doctorate of Literature from Smith College, an Honorary Doctorate of Humane Letters from Widener University, an Honorary Doctor of Humane Letters from Allegheny College, and an Honorary Doctorate of Humanities from Fisk University. Her work has been called intimate, edgy, and unapologetic. In a career that has spanned three decades, Giovanni has created an indispensable body of work and earned a place among the nation's most celebrated and controversial poets; Gloria Naylor calls her "one of our national treasures." She is the mother of one son, and enjoys gardening and the blues music. Meeting Nikki Giovanni reminded me that a writer's words are meant to last. Throughout a long and prolific career, she has tackled almost every form of the written word and has successfully published each time. Her calm, yet distinctive, style comes across in her personal life because life is writing, for Nikki Giovanni, and writing is life. She was browsing in the university bookstore when I spotted her. After I introduced myself as the interviewer who had arranged to meet her, she waved a t-shirt on a hanger in the air, debated the color selection, and settled the purchase with great satisfaction. A gift for a friend, the cloth and thread almost seemed to hold her together. She had received word of another friend's death shortly before it was time to catch her flight to the writers conference, and that news was what was on her mind. Loss and glory interwove themselves throughout our interview. Her thoughts touched on death, mixed with the everyday concerns of the living, and wandered from the innocence of children to the radical injustices of the past. Getting to the heart of this compact and energetic woman was easy because of her warmth and compassion . . . hearing the strength behind her words was harder because, if there is one thing I learned about Ms. Giovanni and her life, it is that she never veers away from the truth. From a look at your website, it's easy to see what a prolific writer you are. Out of all of your writing activities and creative ideas, how do you decide which ones to pursue or develop? Well, I think writing poetry is largely a case of the heart. I don't have any question about that . . . but it's also a big head case because your heart gets interested in things, but if your head doesn't know about them, you end up with this trite crap. I'm a big fan of the black woman and so I'm always looking at aspects of the black woman--what she's doing and how she does it. Coming to a conference like this was always right down my alley. When I was invited, there was just no question about it . . . I wanted to be here. I want to be here. We had a death in the family not long before I was to leave, but I still thought I should be here. It makes me really sad, of course, because this was an older couple. I cook for them twice a week (several of us on the faculty cook for them), and I had the pots on the stove when I found out. Death is always a surprise. This conference is all about remembrances, so it wasn't just that I had committed. I thought being here would make me feel a little better. I do a lot in remembrance. I was asked recently what makes me an Appalachian writer. I was trying to think about it because this is actually not a term I would use--I think of myself as an urban writer. My Appalachian roots come out because of my sense of independence. My Southern roots come out because of my sense of remembrance, and I do see the difference between how Appalachia and the South handle independence . . . or individuality, I should say . . . and remembrance. There is very little individuality in the South. There is such a herd mentality, you wish you could just crack that egg and break it through. There is such a fierce, personal independence in Appalachia. I do see how that works in a black girl from Knoxville, Tennessee, who grew up in Cincinnati. It's what you're constantly dealing with . . . remembrance but also what is your individual responsibility. You asked about my activities. I do what brings me an amount of pleasure. I have a writer's workshop, and I enjoy cooking for friends and family. The things I do bring me great pleasure but also satisfy my sense of responsibility as an individual. I think you should do what you can do. People overlook that and always want to do something way bigger than they can. You are capable of making lamb stew, for example, or frying some shrimp. You don't do that because you want to tilt windmills. Someone once said to me, "You're Quixotic." But I'm not Quixotic. I don't tilt at windmills. I don't fight battles I can't possibly win. You only have so much time. There are things you stand up for because it's right. That's not a battle that you're losing. You're just adding your body and your best wishes to a fight that has to be won. If you could start your writing career over, would you make any changes? I'm a very practical person so that level of contemplation doesn't work for me. There are probably things in my career that could have been more financially beneficial. I had some opportunities to be in commercials and things like that, but it just didn't seem like that's what you did with poets, so it wasn't really that I lost money. I just didn't make it. I think my integrity means a lot. "Nothing takes the place of curling up in bed with a book. In my opinion, nothing takes the place of the smell of the paper. Now that people like me say that, they may come up with a way to make the e-books smell like that." Probably what I'm most proud of is that this is a thirty year career. If you had asked anybody but me, thirty years ago, if I would still be here, everybody would have said, no, she won't maintain. I'm very pleased that it's been a good career, a solid career. For a word that I don't like the way people use, I think I had the right values. I think I had the values of integrity in the work. I'm perfectly willing to take the work just about anywhere. I've read for just about all groups and places because I figure the work is the work and you have to get the work around. I think the work has been wonderfully and almost magically consistent. I keep learning things, and you keep adding what you're learning, but it's been good. I don't even know where the last thirty years went. Over there at the bookstore, what you're looking at is a thirty year output which averages out to a book a year or something like that. There is a poem there I'm going to read tonight called "What He Missed". I was laughing with the editor of Essence Magazine because she needed the poem quickly. I said, "I am prolific, but I am not quick." It takes a little longer when you're putting the work together. If I were advising someone on a writing career, the deal is this: write. If you get it published, good. If somebody pays you, better, because you have to eat, but the deal is you have to write. You see people who say, "I want to have a writing career." If you ask them what they are writing, they say, "Well, I'm not working on anything right now." No, no, no . . . that's not the way. You have to write. My work is not that different now than it was when I was starting out. People want to see big changes sometimes, I think. My early work was . . . I think the term was incendiary, but I don't trust people who make big changes. What you say has been said. You keep trying to say what you're learning and keep sharing it with your audience. I think I've been remarkably lucky. I haven't lost a lot of people, and I haven't gained a lot of people. The people who used to read me in the 60's are still reading me. I think that's kind of wonderful because that's a consistency that changes. It's like stirring the pudding, and the pudding has to be a certain way. It means that I've grown. I didn't dig a hole some place. I'm not God: I wasn't trying to be. I'm not trying to tell people what to do or what to think or none of that. I'm not a leader. I'm not a guru. I'm just a poet looking at the world. People know they can bring their grandchildren, and I can read Genie in a Jar or something from The Sun is So Quiet. They can hear it and tell their grandchildren, "I heard that thirty years ago." I love what Chris Raska (the illustrator for Genie in a Jar) did in developing the little girl. Of course, I'm a big fairy tale because that's all of life; that's anybody. Don't prick your finger because when you prick your finger, you fall asleep. They all did, you know. Snow White, eating those apples. That's all you're saying to the kids. It's, "Okay, careful, Baby." I'm totally fond of that and very happy that we were able to get that illustrated children's book. Do you feel that the online world has or will have a great impact on the world of writing and publishing? "I'm not trying to tell people what to do or what to think or none of that. I'm not a leader. I'm not a guru. I'm just a poet looking at the world." wired places in the world, but I am a writer and we are a part of a throw-back, in many respects. Frankly speaking, I don't think anything can ever take the place of books. I know they're trying to make the e-books more like pages and asking themselves how can they make these computers more like a book. At some point, when you hear that, you have to say to yourself why are you making it more like a book? Why not do a book? We could think about doing something like erasable paper. We could use the Internet and, instead of using a non-renewable source, we could scan again and again on the same paper. Nobody wants to think like that right now. Nothing takes the place of curling up in bed with a book. In my opinion, nothing takes the place of the smell of the paper. Now that people like me say that, they may come up with a way to make the e-books smell like that. I'm not hostile to the electronic world, but I also think that in this rush to make things quicker and better there are no real time-saving devices except maybe the dishwasher. The vacuum cleaner is not even a friend. Now everybody expects your floor to be perfect. You're always on call. The electronic age is not perfect but must be approached with some caution. What advice would you give to young writers today? The authority of the writer always overcomes the skepticism of the reader. If you know what you're talking about, or if you feel that you do, the reader will believe you. That's why we believe Frank Baum. Who would believe Dorothy and a house and a dog up in a tornado? We believe it because the author believes it. We believe Peter Rabbit because Beatrix Potter believes it. You have to. The authority of the writing will always overcome that. You can't hedge your bets. If you do, people will say, "Hmm. Where did you get that from?" You can't do that. Just don't do it. 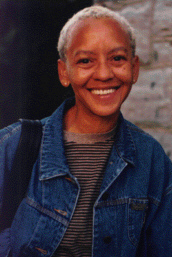 Photograph of Nikki Giovanni by Mari Evans.